I love old vintage linens. They wash fantastically. They iron perfectly. They smell so sweet when you can let them hang out in the afternoon sun. Mmmmm. I would love a nice spring sunny day right now. Sitting in my screen-in-porch with my pretty pillows and a good shabby cottage book or magazine to look it. Dreaming of ways to incorporate the shabby look into my house. I have ton of vintage linens from my mom. When she passed away, I got a treasure. Her huge boxes full of wonderful duvet covers, tablecloths, embroidered table scarves, doilies and more. Ohhh the hand work on some of those duvets is fantastic! 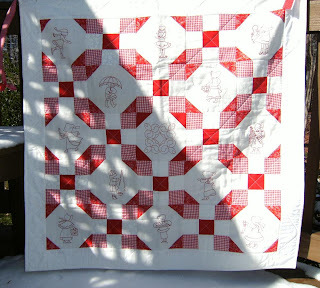 I took some of the duvet covers that were a bit stubborn to get crispy clean and I made this redwork block of the month quilt with them. Just a few days before valentine's day, I bring it out. Iron it. Display it. Remembering all of the sweet things my mother did for my brothers and I as we were growing up. 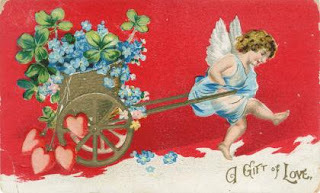 I remember how fun it was in school to pass out my valentine cards. I would come home with a handmade goody bag from school. Filled with cards from all of my clasmates. 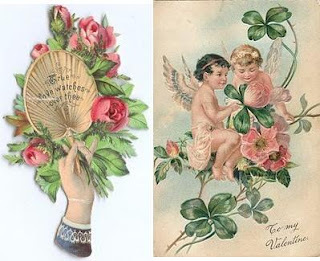 Now I look for those valentine cards in antique stores and flea markets. Technology is terrific too!! You can get your vintage images on-line. I am not this vintage, but I do love this old look!! One more commitment to finish. "The Winter Time Mini Quilt Swap"
I just don't know what to make this time. 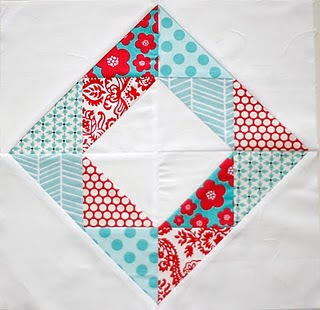 I am learning toward a sweet valentine block of the month pattern that I have always wanted to do. But that doesn't really say winter time to me. 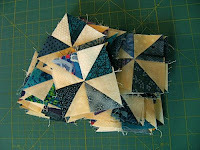 Maybe there is sometime cute on Quilter's Cache. Or maybe better yet, take a block from a stack of "Love Note" blocks that a friend gave me and turn one of them into something super cute. One of my finished group swap projects was to make 22 stretched star blocks. They are all done and ready to be mailed. Every waste triangle was used to make this sweet banner hanging from a tree in my backyard.